Once again, Australia has hit a new record with a total enrolment of 624,000 foreign students in 2017. This represents a 13% increase over the previous year, according to the Australian Department of Education and Training (DET), and compares to average growth of roughly 4.5% per year over the previous decade. Close to 200 nationalities are represented in Australia’s international student population. Of the total, more than half (53%) of all international students in the country come from five sending markets: China (30%), India (11%), Nepal (5%), Malaysia (4%), and Brazil (4%). The higher education sector enrols the lion’s share of international students (44%) with 350,470 students, an increase of 15% over the 2016 total. Next is the VET sector with 27% (217,700 foreign students); this sector also experienced robust growth over 2016 (17%). The English-language sector enrolled 19% of all international students (155,450) but grew by only 3% over 2016. Meanwhile, the secondary school sector accounted for 3% of students (up 11%) and non-award programmes such as exchange and foundation programmes claimed 6% (up 14%). The surge in Australia’s foreign student numbers over the past several years is positive news overall, but some sectors and institutions have attracted a disproportionate share of the growth. For example, four of the Group of Eight institutions in Victoria and New South Wales (Monash University, University of Melbourne, University of Sydney, and University of New South Wales) increased their market share from 18% to 22% between 2010 and 2016. 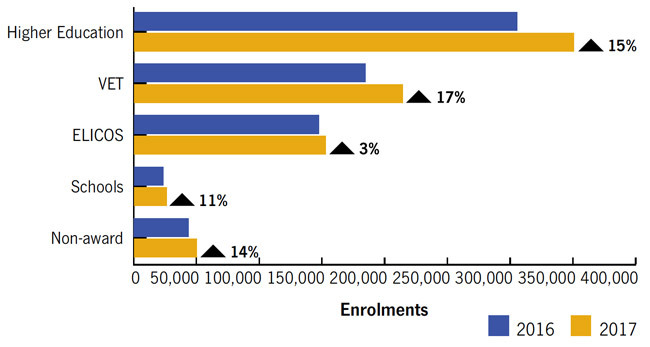 In the same period of time, growth in postgraduate enrolments (6% per year on average) also outstripped that of undergraduate enrolments (1%) – a sharp reversal of the picture in 2010, when the number of international undergraduates in Australia doubled those studying at the postgraduate level. Phil Honeywood, chief executive of IEAA, adds that the current student visa policy framework – the Simplified Student Visa Framework (SSVF) – may be playing a part in discouraging education providers from entering into new markets. Under the SSVF, the greater the number of students who are denied visas, the greater the chance that an institution will not maintain its immigration risk rating. Therefore, when it appears that students from a certain market are experiencing high rates of visa rejection, it follows that institutions become wary of recruiting there. For its part, Austrade projects that China and India will remain the top sending markets for Australia through 2020, but it forecasts a different mix of leading senders otherwise, with Pakistan, the Philippines, and Indonesia rounding out the top five, and Bangladesh entering the top 10 for the first time. Australia’s English-language sector (ELICOS) posted modest overall growth (3%) relative to the other education sectors, and in the last half of 2017, booked actual declines for the first time in a decade. The fortunes of ELICOS have been shown to have a knock-on effect on the country’s higher education and VET sectors, and observers expect that lower ELICOS commencements in the final months of 2017 will in turn impact higher education and VET commencements in 2018. According to Universities Australia, the Australian international education sector generated more than AUS$30.9 billion (US$24.4 billion) in export income in 2017. This entry was posted in Australia, Australia/Oceania, Higher Education, K-12, Language Learning, Most Popular, Regions, Vocational and tagged universities with international students, colleges with international students, secondary schools for international students, study abroad, undergraduate student recruitment.